This beautiful room is designed and decorated by the talented team at One King's Lane. I really love how fresh and feminine it looks! 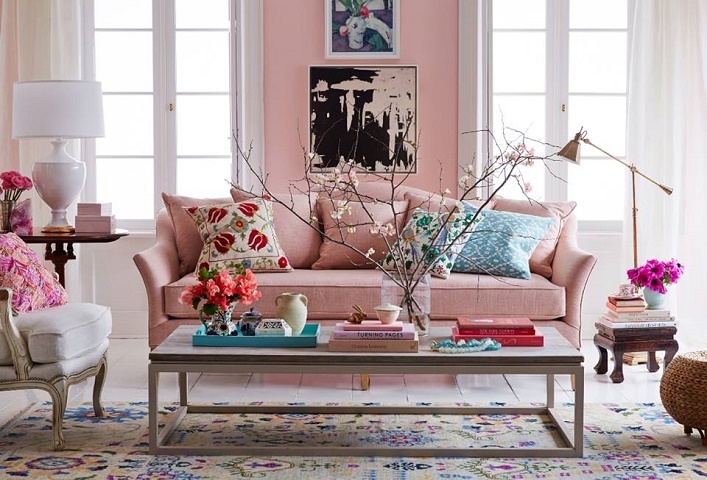 I am particularly drawn to the soft pink walls and the complementary pink sofa. The eclectic artwork and accessories create visual interest and add a wonderful dynamic with the rest of the space, don't you think? Oozing an effortlessly chic vibe, I can't help but be inspired by this gorgeous room. Are you drawn to this delightful space as much as I do? A Lovely Room Of The Week for Valentine's Weekend!